Rose is from Cameroon. I’m from Uganda. On opposite sides of the continent, I grew up speaking English, while she grew up speaking French, the languages of our colonial masters. Now here we both are, just outside Washington DC, thousands of miles away from our respective homes, finding kindred spirit in our shared status as immigrants, but failing to communicate because of our language barriers. What little French I once spoke has been reduced by obsolescence to just a few catch phrases. Rose’s English is as challenged as my French. 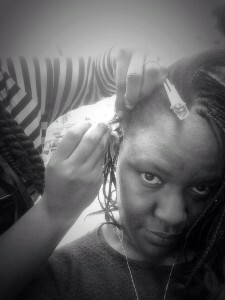 I have taken the day off so she can braid my hair. I found her phone number on a large red sign hanging on the window of a store in a rumpled Takoma Park strip mall. So far, I have managed to talk her down from $150 to $120 – we both know no one should pay full price. But our languages make it hard for me to communicate the style I want or for Rose to explain to me my options. A black beauty magazine lies on top of what must have once been a telephone stool. We both reach for it, expecting salvation, and laughing at our struggle. Rose’s Ethiopian co-worker steps in and points to a beauty supply store across the street on New Hampshire Avenue. “Maybe you can go there together and pick the style of braids you want,” the Ethiopian says. Together, the Cameroonian and I scoot across the street, dodging cars and laughing like teenage girls going to fetch water from the well. “Pony tail! Pony tail!” I shout as I spot the hairstyle I want on the back shelf of the store. “Ooooh!” She now understands what I have been trying to describe. She picks up four packs of the curled synthetic hair braids and we dart back across the street. “I wish I speak English,” she says. I looked at the D.C. Metro bus app open on my phone as it lay on top of the toilet cistern. I was still combing my hair, but the app was warning that my bus would be coming in four minutes. My bus stop is two blocks away. I could not afford to miss that bus to the train station. The next one would come 18 minutes later and was bound to be slowed by the morning traffic. I’d deal with the hair later, I reasoned as I grabbed my phone, dashed to my bedroom, pulled on the clothes I had picked and scampered down the stairs, gulping from the burgundy cup of hot black tea I had set on the bathroom counter to sip as I groomed myself. My two neighbor’s pesky chihuahuas didn’t bark as they do every time I have pivoted down Quackenbos street to catch my bus on the main thoroughfare. I could see the bus approaching, but impatient drivers would not let me cross the street to the other side. I ventured into the road, forcing coming cars to slow down. The zebra crossing sign on the tarmac is faded, so pedestrians must be aggressive about getting to the other side. I made it just on time to be a spectacle on the bus, as sleepy, maybe bored commuters looked at this disheveled beauty with a comb in one hand, rummaging through her purse for her Metro card and adding a minute to their commute. I walked from the front of the bus, fielding amused and annoyed looks from other passengers. As the bus approached my final stop, I stood up before it had made a complete halt and the inertia sent me tumbling back onto the seat, my behind landing gently on the person next to me. Could I make a bigger spectacle of myself? As I darted off the bus, pulling out my phone to send a morning tweet or two – something about the monthly employment report due this morning from the U.S. Labor Department- , I heard footsteps coming after me. Is This The Right Party? Puzzled, unfamiliar faces stared back at me, red frat party-type plastic mugs halted midway to mouth. It was a party alright, but the wrong party. I had been headed to my friend Jo’s birthday party and had just arrived at the apartment complex, when my phone battery died. Catherine, another friend, had reminded me of Jo’s building address as I dropped her off some doors away and went to find a parking place. I promptly forgot the address. I wandered around the condominium complex, trying to jog my memory. 721 or 741? The dark, cold night wouldn’t help my memory. Then I heard music booming out of one building and thanked the universe for bestowing upon me ears that worked. With my ever over-enthusiastic, sanguine, mouth-in-first energy, I flung the door wide open without knocking, happily announcing my presence, expecting welcoming applause from friends. It was at this point that I encountered the puzzled, unfamiliar faces and the plastic red mugs. There were about 15 people in the room. “Oh hey! Am I at the wrong party?” I asked, maybe semi-announced. In one hand, I had my phone, my charger and car keys. In the other, I carried a pair of golden high-heeled shoes I planned to wear once I shed the boots I had on to keep my feet warm. “I think you’re in the wrong place,” a woman told me. She was kind about it, but was clearly puzzled. I started laughing. They started laughing. Two of the women invited me to stay, and plugged my phone to charge long enough to retrieve my friend Jo’s apartment address. I knocked gently on Jo’s door, careful to make sure I was entering the right apartment this time.